We wanted to create a show of work that stuck together, literally and figuratively. The Traveling Magnetic Show rides on the VALVAN. 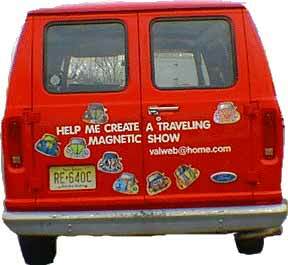 Artists, children ..an open invitation extends to create a magnetic piece for the van. The show changes, moves around on the body of the van. When it is not on the van, it can be seen on refrigerator doors. December '98 The Hub-With Magnetic Connections visited the Cork Gallery downstairs from Avery Fisher Hall, Lincoln Center, NY. Click here to see recent mag pieces, the changeable parts show about work that sticks together both literally and figuratively.